As people across the United States watched the solar eclipse on August 21, 2017, Amir Caspi, Class of '96, was in a hangar at Ellington Field southeast of Houston, Texas - far outside the path of totality. 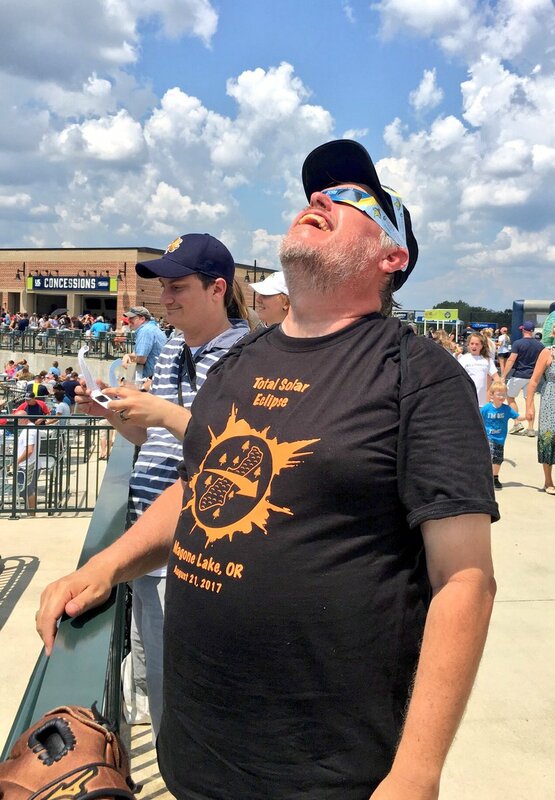 His eyes were fixed on two computer screens showing live video feeds from a pair of jets flying 50,000 feet above Missouri, both pointed at the sun. For more than an hour, the pair of jets chased the eclipse across Missouri, Illinois, Kentucky, and Tennessee, following the path of totality - each jet recorded the total eclipse for about 4 minutes. Dr. Caspi, a senior research scientist at the Southwest Research Institute, was the principal investigator for the NASA-funded mission, and the images he saw were just was he had hoped for - the moon's shadow blocked the face of the sun, revealing striking details of the solar corona. It was the culmination of more than a year of planning and preparation for Dr. Caspi and his team. Caspi has always had an interest in astronomy: "As long as I can remember - as early as 8 years old," he says. At Blair, he fell in love with physics in classes with Mr. Bunday and Mr. Donaldson, and mathematical physics in his senior year with Dr. Alperin. By the time he went to college, Caspi had decided that he wanted to be "a physicist focused on astronomy." At the University of Maryland, he majored in both, graduating with bachelor's degrees in physics and astronomy. He also earned a degree in computer science and mathematics, giving credit to the programming background and the strong foundation in math he got from Blair. Caspi went to graduate school at UC Berkeley hoping to do high-energy astrophysics - studying "powerful events in the universe, like [the formation of] black holes and neutron stars." During the open house, his advisor recruited him to do high-energy solar physics - solar flares and other eruptive processes. Caspi explained: "His hook was that I could basically study many of the same high-energy processes but with an observing target that was much closer to home." And that was how Caspi became a solar physicist, or as he prefers to say: "a stellar astrophysicist who happens to study the sun." For his dissertation, Caspi studied the super-hot plasma of solar flares using X-ray spectra and images from RHESSI, a small observatory that was launched in 2002 with the ability to generate images and perform spectroscopy without the use of optics, since it is difficult to focus X-rays. RHESSI uses an indirect method, as Caspi explains: "it essentially takes images in Fourier space" and "builds a probability map for where the photons came from." Magnet alumni enjoyed the 2017 eclipse and shared photos on Twitter. Marc Pulupa '99, a UC-Berkeley physicist, was interviewed on TV with KRON4. Helen Fields '93, wrote about her eclipse road trip. In 2011, Dr. Caspi started a post-doc at the Laboratory for Atmospheric and Space Physics at the University of Colorado (CU), Boulder. Later, in 2014, Dr. Caspi joined the Southwest Research Institute (SwRI) in Boulder, joining a group of scientists doing planetary physics and astrophysics, including heliophysics. In Boulder, Dr. Caspi got involved in several other projects with unique platforms. He was a co-investigator on the CU-led Miniature X-ray Solar Spectrometer (MinXSS) CubeSat, which was NASA's first CubeSat science mission - it launched from the International Space Station in 2016. He was the principal investigator for another miniature x-ray spectrometer, the SwRI Miniature Assembly for Solar Hard X-rays (SMASH), which flew on the UC Berkeley-led Gamma-Ray Imager/Polarimeter for Solar Flares (GRIPS) that circled Antarctica on a high-altitude balloon in 2016. He also participated in three sounding rocket missions for solar spectroscopy and imaging. The solar eclipse in August 2017 would provide another unique research opportunity for Dr. Caspi, and he knew it would be a perfect chance to study the solar corona, the outer atmosphere that is composed of hot plasma. Dr. Caspi identified two questions that might be answered by observing the corona during an eclipse: First, "Why is the corona so hot?" While the sun's surface is thousands of degrees, the temperature in the corona is millions of degrees, and "we don't know how the energy is getting there." One theory is that Alfvén waves in the sun's magnetic field are carrying energy into the corona, but the waves that have been previously observed don't appear to carry enough energy. Another theory is that nanoflares, "little explosions that release stored magnetic energy," are heating the corona. The second question: "Why is the solar corona so well-organized?" Images of the corona show "loops and arcades and fan structures," but when you follow these structures to the photosphere, "it looks like a boiling pot of water" where convective cells drag the foot-points of these loops. Dr. Caspi believes that to maintain these structures above the turbulent photosphere, there must be "some process that constantly releases these complexities and twists in small bits." High quality video of the corona might show evidence of these dynamic features, and one of the best opportunities to obtain such video would come during the eclipse. Although the sun and its corona are visible in the sky every day, it is difficult to make detailed observations of the corona in visible light because the sun is so bright. Dr. Caspi explains that "the corona is about as bright as a full moon, but it is so diffuse than any individual region is much dimmer, and the solar disk is about a million times brighter." Astronomers observing the corona typically use telescopes known as coronagraphs, which have occulting discs placed in front of the telescope to block out the dazzling surface of the sun. These coronagraph observations are still affected by the brightness of the sun, however, because there is diffraction of sunlight around the occulter. To minimize this effect, a typical coronagraph has an occulter that is at least 3-5% bigger than the apparent size of the sun, blocking out a portion of the corona. 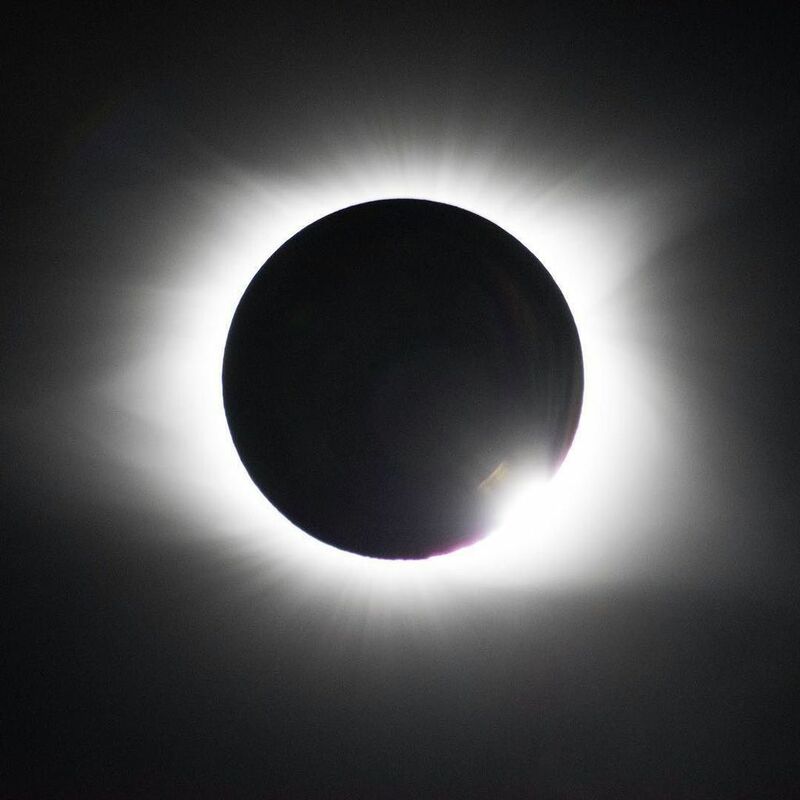 During the 2017 solar eclipse, the moon was only 1.5% bigger than the apparent size of the sun, allowing observations lower down in the corona. And because the moon is so far away, diffraction is negligible. Another problem with ground-based observations is the intense sky brightness due to scattering of light in the atmosphere, but during an eclipse there is much less sunlight scattering in the shadow of the moon. While an eclipse is a perfect time to observe the corona, there are still other atmospheric effects to contend with, and there is a short observation window - totality only lasted about 2.5 minutes for a stationary observer on the ground. Dr. Caspi and his team had an idea - one of the team members, Dr. Constantine Tsang, also a senior research scientist at SwRI, was familiar with NASA's WB-57 aircraft, which are used for high-altitude research that is typically focused on climate and weather. The WB-57s had never been used for astronomical observations, but the eclipse was a unique opportunity to propose a new mission to NASA. By flying at high altitude, there would be less atmosphere to contend with, and if the jets flew along the path of totality, they could extend the time of observation. The WB-57s have a cruising speed over 400 miles per hour, and flying two jets spaced about 70 miles apart would allow the shadow of the moon to sweep over each plane in series, providing an opportunity to observe up to eight minutes of totality. Dr. Caspi and his team began putting together their proposal in the summer of 2016, and they submitted it to NASA in November of that year. In February 2017, they were selected as one of eleven NASA-funded missions for the eclipse. 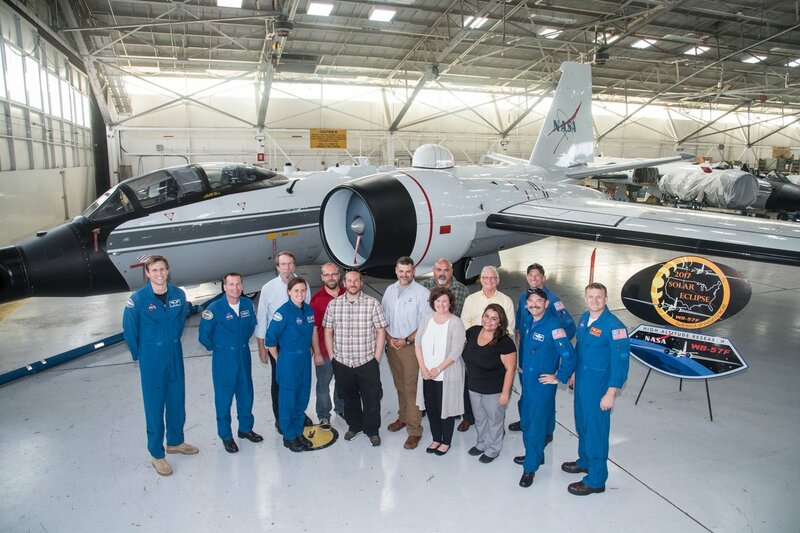 Between February and August, Dr. Caspi and his team worked with the NASA pilots and engineers, and a team from Southern Research in Birmingham, Alabama, who built the imaging platform on the WB-57s. On the nose of each aircraft is the Airborne Imaging and Recording System (AIRS) that houses a camera platform called the Day-Night Airborne Motion Imagery for Terrestrial Environments (DyNAMITE). DyNAMITE includes both a high-definition color video camera and a mid-wave infrared camera. The visible cameras would be configured with a green filter targeting an iron-14 line that is prominent in the corona (Dr. Caspi explains that this was once hypothesized to represent a new element called "coronium"). The infrared cameras would observe around 3-5 microns, which is usually a very difficult wavelength to observe from the ground because of atmospheric emission and absorption. In the days leading up to the eclipse, there were a few emergency repairs, and on the morning of August 21st, there was a little bit of trouble with one of the live video feeds. Dr. Caspi remembers feeling "nervous, excited, and anxious." He watched each plane take off from their home base of Ellington Field, near Johnson Space Center, and the pilots hit their marks - flying north from Texas over Arkansas to Missouri and entering the path of totality just ahead of the moon's shadow. 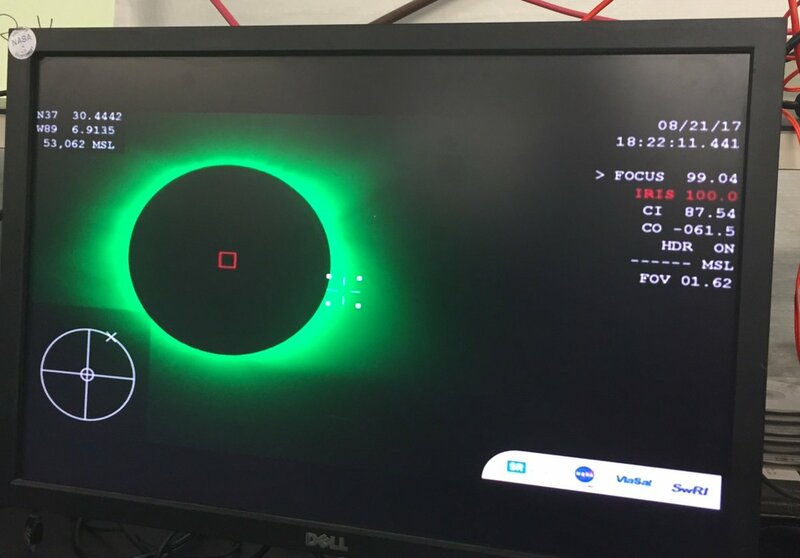 The live video feed came back online just in time for totality, thanks to quick work by the engineers from NASA and Southern Research working with a team from ViaSat, who had donated the satellite time for the live transmission. The mission received extensive press coverage, featured on the PBS special, Eclipse Over America, and the Science Channel's Great American Eclipse. NASA also produced a promotional video for the mission, and the Southwest Research Institute released a collection of initial photos and images. The mission was covered by many news outlets, including interviews with Dr. Caspi on CBS News in Denver and i24NEWS in Israel - more media and photos were shared on Dr. Caspi's Twitter (@astronamir). At 30 frames-per-second from four cameras, Dr. Caspi's team obtained over 5 terabytes of data - possibly some of the highest quality video of a solar eclipse ever taken. They are now working to analyze the data, which requires some careful calibration because the DyNAMITE platform was not originally designed for astronomical observations. Dr. Caspi and his team hope to have some of their eclipse results ready to present at the 2017 American Geophysical Union Fall Meeting in mid-December.